Summer feels so close now that only a morning or two separates it from spring. Today the "boundary" may disappear, with spring dissolving into the hot and hazy days of the mid-year. Still, no fireflies ply the darkened woods, though last evening I went outside several times just to look for them. I stood on the deck and looked into the woods. I heard a great-horned owl in the distance, the final calls of the nearest Eastern pe-wee and an ovenbird, but saw no fireflies. Should I worry yet? I don’t normally keep track of the season’s first appearance of fireflies, though I have the sense that I should be seeing them by now. I hope they haven’t met the fate of many of the nation’s honeybees, though I have no evidence for that fear. This spring has been unusually beautiful, almost measuring up to the Disney-esque version of it. Unfortunately, that beauty comes with a price. It has also been quite dry, one of the driest Mays on record, now more than 3" of rain less than usual. Unless June turns rainy, the price will be paid later in the summer, likely in August or even September when wells dry up and the harvest suffers. But last night it was too soon to worry about that, though the shadow of that worry won’t go away until the rain comes. In other news: Dumber than Dirt, (see post of two days ago) was out again this morning, walking along the edge of the road as I left Roundtop and headed towards work. 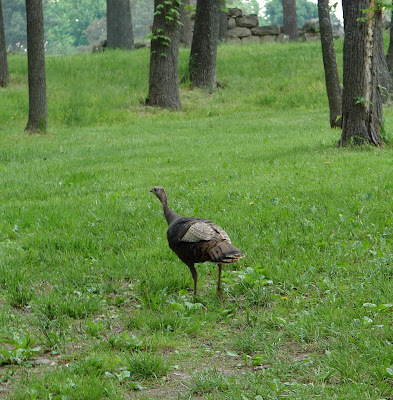 Mr. Turkey paid no attention as I drove by, stopping on the hill to take his photo (again). I sort of expect to find him dead along the road one morning unless he wises up soon. This farm, seen from a distance as I skirted the edge of the forest, already has the look of summer about it. Summer’s haze is just starting to build up in the distance. 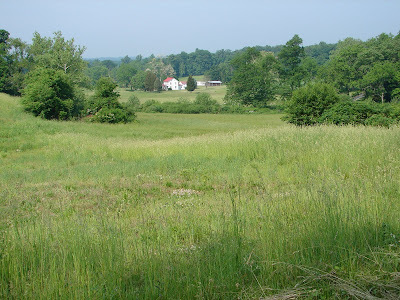 This farm, like many in my area, was built in roughly the Civil War era. At the cabin, I still haven’t seen any fireflies. Normally I associate Memorial Day with their appearance, so I’m starting to feel their arrival is a bit late. Temperatures are to reach into the summer range today and later this week, so perhaps that’s all that will be needed for them to appear. I found my 50th bird species for May at Roundtop this morning. A lovely Black Vulture was sitting on the edge of the dumpster when I went to toss my garbage this morning. I’ve been looking for one of them for weeks and can’t believe I didn’t see one before today. I tried to get a photo, but the bird was too wary and lifted into the air as soon as I stuck my arm with camera out of the truck’s window. I’m just happy I’ve broken last year’s May bird total, which was a pretty dismal one. The mountain hasn’t had a good warbler flight for three years now, though this mountain has never been a warbler hotspot. In earlier years of living here, I often had 10 species in a day. Lately, I haven’t even had half that in a season. I keep track of bird species that I see by month and that creates an interesting bar graph, with May the biggest month of the year. The number of species I see in April and June are usually identical, a few species less than the total I see in May. During July and August the totals drop still more. This is likely due to two reasons—the birds are nesting and tend to be less "showy" or vocal then, and it’s so hot I likely spend less time birding then. In September my totals bump back up a bit, though not to the levels of April, May and June, before falling off still more each month through the end of the year. So far in 2007, I’ve had just two months where I saw more species than last year—March and May. The higher March result is likely caused by an early end to winter. My February result was the lowest ever—when winter finally kicked in, almost the only birds I saw were my feeder birds. Each birding year has its own trends, its ups and downs, its differences from one year to the next, even with common species. This year, for some reason, indigo buntings are in very short supply. But I have tons of Baltimore orioles, several rose-breasted grosbeaks and more Eastern kingbirds up on the slopes than I ever remember seeing before. It’s the differences that keep my record-keeping interesting. 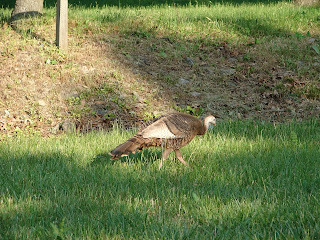 Wild Turkeys are weird birds, I think. Sometimes they act remarkably canny and smart. The next time they seem dumber than dirt. This bird falls into the later category. I snapped its photo as it was slowly ambling through Roundtop, in the middle of a wedding party this past Saturday afternoon. Kids running with balloons were just a few yards away. As I said, weird. Anyway, this bird marked the 49th species of bird I’ve seen at Roundtop this month. For the year I’ve seen 64 species so far. I spent most of the non-raining, non-thunderstorming part of my holiday weekend trying to find species #50 for May, simply because last May I also found 49 species, and I’d like to best that total. So far, I still haven’t found that 50th species but I still have a few more days to go. It really shouldn’t be that difficult, but one of the things that keeps me interested in birding is that things (and birds) that shouldn’t be difficult often are. Despite the fact I didn’t get my 50th May species, I had several good sightings, in addition to this rather dazed-looking turkey. To me, the most intriguing was the sighting of a male and a female rose-breasted grosbeak. Typically, these birds don’t nest much in this area, preferring more northerly sites. But here it is the end of May, and these two were hanging around the cabin all weekend. The male has been filling the woods with his distinctive, loud call and assorted chirps virtually every time I stepped outside. They spent most of the time flying back and forth from one side of the driveway to the other. Several times, the male was singing just a few feet above my head. I haven’t seen them carrying any nesting material but they sure have been fun to watch. And who knows, maybe they will nest here. How cool would that be? 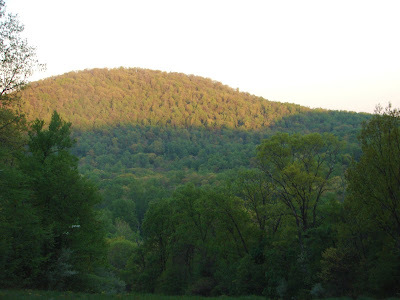 ROUNDTOP--This photo doesn’t look like much now, but just two hours ago it was site of an encounter between a human (X) and three canines, one domesticated and two wild, free and untamed. 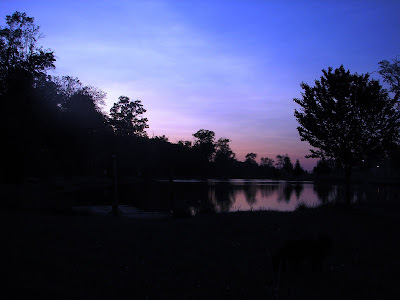 At approximately 5:30 a.m. the human and the domestic canine (Dog) were out for a morning walk along the bank of this serene pond. "I don’t usually walk here in the morning," the human said. "This is normally our evening walk. I don’t often have the time to walk the whole way around in the morning, and until this week it hasn’t been light enough at 5:30 a.m. to walk here, anyway." But this morning there was time and it was light enough. And here’s what happened: Human and Dog were proceeding north along the rim of the pond when suddenly, from out of the tall grass on the bank, appeared the two wild canines. All four apparently first saw each other at precisely the same instant. All four stopped dead. 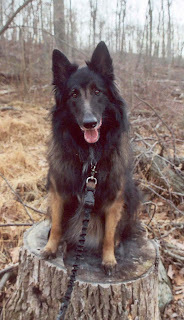 The domestic canine (Dog) was tethered to the human with a long leash (see photo) . Dog was separated from the first of the wild canines by a distance of approximately 20 feet, the human was another 15 feet back. The second wild canine was a few feet behind the first. "Boy, were those red fox beautiful," the human said. "Both looked in great condition. I saw the first one the best, and that one was a large fox with a lovely coat." For a few heartbeats, all four animals stared at each other. And then the foxes took off, racing down the bank towards the forest. Before reaching the tree line, the lead fox barked. ("I hear them barking at night all the time," the human reported.). The domestic canine (Dog) was frantically excited and tried to chase them (or perhaps join their pack) but was deterred by the human at the end of the long lead. Dog settled for tracking the red duo back to the water’s edge, where the two were apparently sharing an early morning drink of water before the encounter. Then Dog traced the angle at which they approached the pond from the woods, until, once again, he was deterred by the human. 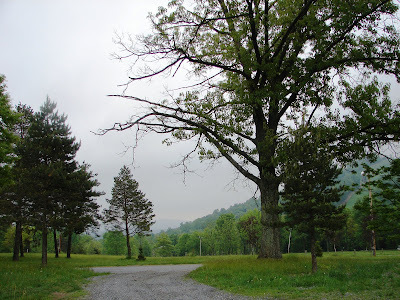 I spend most of my time on the mountain, and when I leave the mountain to work, run errands, visit family or friends, I always head north, first through miles of orchards and then into rural suburbia, followed by city suburbia. I rarely head southwest, as I usually have no reason to do so. 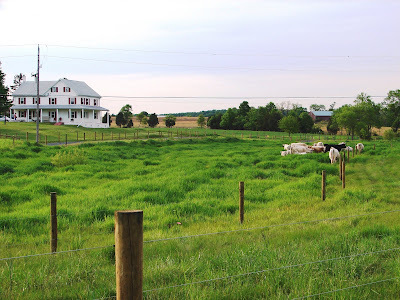 It is a measure of how infrequently I head in that direction that when I did so recently and found miles of family farms, the view seemed almost exotic to me. Forest to orchards to suburbia pretty much sums up the human habitats of my life. 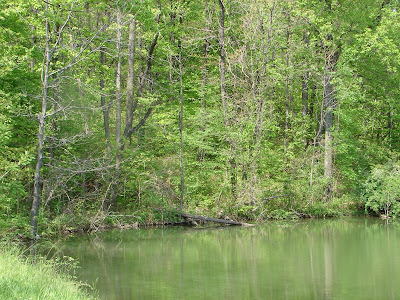 These habitats are my "normal," and my world view is nurtured and formed by the habitats I know best. Other people will have their own normal habitats that help to structure their own world views. My normal habitats are certainly not unique, but I’m starting to appreciate that because they are not the most common ones my take on life is different and changed by those environments in which I spend most of my time. I have tried to imagine what my life would be like if my habitats were, say, town to suburbia to city. Or what if my habitats were city to beach? My entire view of life would be different than it is today. Difficulties come when someone with my human habitat base interacts with someone whose habitat base is my polar opposite. Our goals, our understanding of our habitats, our needs within the context of those habitats may well find little common ground. And as more people come to share similar habitats, the more those of us who don’t live in those habitats become obsolete, squeezed out of the mix as surely as bulldozers push over trees. In part, one of the reasons why I write this blog is try and show people who don’t share my habitats what my habitats are like, in hopes that we don’t lose whatever common ground we still share. The woodland is the haunt of many a joyous thing, which frequents the glades and hovers over the flowers. Isn't this a lovely moth? I found him or her on an outside wall of the cabin the other night. To me it looks as though this moth is wearing army camoflauge. 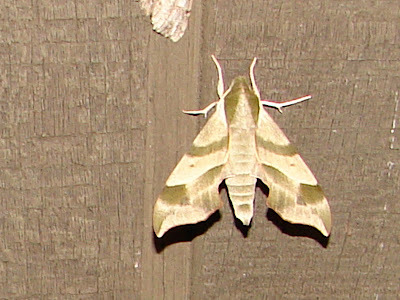 I'm pretty sure it's one of the hawkmoths, which are all large, thick-bodied and often brightly colored moths. I think it might be of the Darapsa genus, possiblly Darapsa versicolor, which, if true, is a good find. Although considered rare in much of its range, it was found commonly in western Pennsylvania, which isn't all that far away. I have a great identification book for moths. It's called The Moth Book and was written by W. J. Holland, director of the C arnegie Museum in Pittsburgh in 1903, though my copy is from 1922. The book has 48 color plates of color photographs of moths, often 20 or more moths to the page and is still the best reference I've ever seen for moths, both in its photographs (color photography must have still been in its infancy in 1903) and in the sheer number of moths described, which must be close to 1000 species. Holland collected all the moths for his book, which he dedicated to Andrew Carnegie. Near the center of the guide Holland wrote a wonderful essay called "Sugaring for Moths." It starts out: "The day has been hot and sultry. The sun has set behind great banks of clouds which are piling up on the northwestern horizon. Now that the light is beginning to fade, the great masses of cumulus, which are slowly gathering and rising higher toward the zenith, are lit up by pale flashes of of sheet-lightning..." Who can resist? The essay goes on to describe the method Holland used to trap his moths, a method you can easily adapt, even if you do so only to see some of the amazing moths that ply the night so inobtrusively. Holland mixes sugar with "stale beer and rum." I think any sugary alcoholic beverage will do, though rum is an excellent choice. I just mix sugar and rum, or molasses and rum, which can then be thinned with water. Holland used a brush to paint trees in the forest with this concoction, hung lanterns by each and waited. I suggest covering a sponge with your concoction, placing it outside and then just leaving the porch light on all night. You'll be amazed at the number and diversity of moths that will still be there in the morning, drunk on the alcohol. Most of the time, I don't drug the local moths. I just check the cabin wall by my porch light in the evenings. The number of moths I get this way aren't as high as when I use the sponge method, but I don't need to do anything specialfor it. Perhaps once a year, often on a hot August night, is when I use the sponge and alcohol mixture to see moths. When I come out of the cabin in the morning, the sides of the cabin and my outdoor plants are just covered with moths. After an hour or so in the morning, the moths will recover and disappear back into their daylight hiding places. I can hear you saying, "am I at the right blog?" The answer is yes, you are, but today's post is not about the woods around my cabin, but about my hometown's renovation of its oldest and most historic building, Dill Tavern. This past weekend the tavern held its annual Publick Tyme event, with food, crafts, demonstrations and food. Did I say food? This event also marked the first time the public has been able to see a nearly-finished upstairs in the old tavern. The local historical society has tried to buy this old tavern ever since I was a child. Several times the tavern was in danger of destruction by comm ercial concerns, as it is conveniently located near a four-lane highway and has road frontage on it. Somehow, that was always avoided, usually at the last minute. The tavern was also owned by a few people with good intentions about renovating it, but they usually ran out of money quickly. But eventually, after all these years, the local historical society was finally able to purchase the tavern after some very generous donations from local townspeople, one in particular. Since then, renovation has been ongoing and naturally slowed by more lack of funds. Finally, it's getting to the point where the tavern is the glory it should be. My first two pictures are from the downstairs. 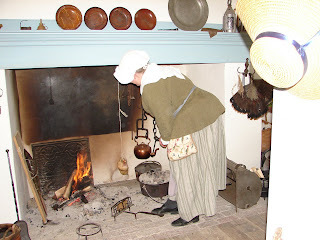 A local resident is cooking on the hearth. She's spinning a chicken on the right side of the fire, and shad (that's a fish to those who don't know) are tacked onto a board leaning on the left side of the fire. 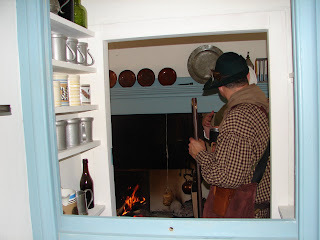 The second photo shows how the tavern was set up. The little pass-through is where the tavern supplies were kept. I took the photo from the side where the customers would be. My third photo turned out a little blurry, but I like it so much, I'm posting it anyway. 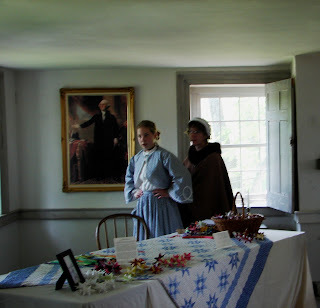 It was taken upstairs in a room where they were showing some colonial-era crafts (and mom was fixing the young girl's dress, while standing next to a portrait of George Washington). It looks like they just stepped out of 1776, doesn't it? We can't prove George Washington stopped here, but it seems likely that he did. Tavern records confirm that during George's surveying days, he stopped at the tavern some miles to the south and several days later stopped at the tavern miles to the north, and the only tavern in the middle was Dill Tavern. Unfortunately, while we have many old tavern records, the book that would have shown George at Dill Tavern is missing. If you want to see the outside of the tavern click here for a link to a post from last year. Sometimes I actually leave the mountain! This weekend the forecast called for rain. It didn't. Instead, most of the weekend was clear, with low humidity--the kind of weather I'd like all summer long. I'd like to say that I got a lot of clean-up work done out around the cabin, but that wouldn't be true. Typically, by mid-May, it would not be unusual to have already had a few warm to hot days. That really hasn't been the case so far. The days and evenings have been cool--not that I mind. The cooler temperatures haven't slowed the spring foliage at all, as far as I can tell. The greenery is at its lushest right now. At night, when I look outside through the canopy of the trees, I can only see a few pinpricks of sky from the cabin. Even at the end of the lane, I can only see patches of sky--just barely enough to tell if it's cloudy or clear. If I really want to look at the sky, I have to walk to the end of the lane. It will be that way into October. It is a busy time in the woods--I see raccoons commonly and hear the red fox barking evening other night or so. The barking is always near the cabin but never in the exact same place. It always sets the dogs' hackles to rise when they hear it. I'm sure they recognize it as another canine, but they also recognize its strangeness--at least to them. The rough-winged swallows are here, and I think I caught a glimpse of an Eastern kingbird out on the slopes. Dutchman's breeches are blooming. The wood violets continue to bloom. This year they are the lushest and most numerous I've ever seen them. Summer is still not quite here. I haven't seen any fireflies lighting up the woods yet. When they show up, I'll know it's summer, whatever the temperatures are doing. Last night I finally had some time to sit outside after dinner and observe the activity (and sometimes the lack of it) that happens in the woods. When I’m outside, without a task to occupy me, my mind travels in many directions. It’s like meditation, or perhaps it is meditation, but it’s considerably more refreshing than sitting in a room. Sometimes my thoughts are mundane ones, sometimes I stumble into an insight or two, finding a thought that never occurred to me before. On a quiet spring evening, when the wind doesn’t stir, the sense I experience most is sound. Bird calls chime from everywhere, though most of the times the birds themselves are hidden deep within the leaves. It’s no surprise that sounds dominate. The foliage is so thick that even birds likely can’t see each other, so their songs tell each other where they are and what they are doing. I am routinely surprised how loud a tiny bird is. Last evening, a wood thrush, which is actually an average sized songbird, sat on a tree just several feet above my shoulder and sang for an hour. That bird was loud! I almost wished it would move away 15-20 feet to give my ears a rest. But of course, not really. The sound is so sweet. 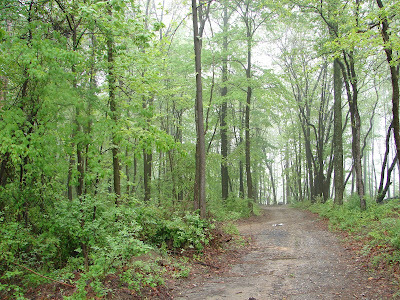 Eventually, the wood thrush stopped singing, and the woods suddenly seemed emptier. Such a little bird, really, to produce that much sound. It’s a good thing the song of the wood thrush is so beautiful or I might have fled into the cabin. The development of such a loud song must have come about when the birds were few and far between—so the sound had to carry in order for them to find mates. And in many places that may still be the case, though it’s not, here in my little corner of the forest. I’m fairly sure I counted at least 10 separate birds last night. The wood thrush was hardly alone. Ovenbirds sang loudly, too. Pewees, phoebes, robins, one exceptionally loud cardinal (among several others), towhees and others filled the woods with sound, occasionally supplemented by the staccato of a flicker or an excavating woodpecker. The forest eventually quiets. Darkness comes to the woods before night touches the sky. This has been a busy week so far in the evenings after work, so I've had no free daylight time at home at the cabin. Tonight is a free night, and I've told myself that the housework will just have to wait another day. The sky is blue, the day is clear, and though it's still only morning, I'm already planning to spend most of my evening sitting out on one of the decks, accompanied by binoculars and camera. Sitting and watching is perhaps my favorite outdoor activity. Most people simply move around too much to really see anything. All that moving creates a lot of noise, and the noise and the motion makes the woodland residents hide. Scouts hike, campers sing around campfires, birding groups see the bird and then move on to the next one. There's nothing wrong with any of that, but it's by no means the most interesting or instructive way to spend time in the woods. Have you ever watched a deer move through the woods when it's not stressd? They move slowly, stopping often. And birds? When was the last time you actually watched a woodpecker at work? Most of the time they're very deliberate in their excavations. Move slowly and you're a part of the woods. The woodland residents don't fear your presence and will carry on their own lives while you're out there too. Most of the time, they will happily go about their business while you're out there, and you might well not even need your binoculars. Move quickly, make noise, and in their minds, you're a threat. I will keep this sermon short (see photo), but my advice is simply: Slow down! Sit. Watch. If you really want to learn about the outdoors, that's the only way. 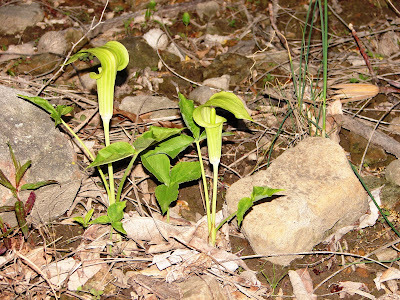 Oh, and for those of you who didn't get the sermom reference, today's photo is a jack-in-the-pulpit. Happy sitting! This morning's photo was taken at one of the old snowmaking ponds for Roundtop. And like everything in the photo (including the reflection), everything around me is green. Even the deep brown of the tree trunks is overwhelmed by spring greenery right now. It’s a little weird or off-key, somehow, for one color to so completely dominate all the other ones. 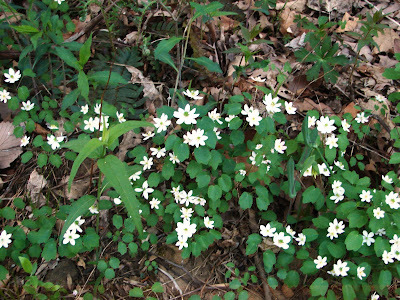 The tiny and delicate violets, whites and pinks of the woodland flowers get lost when surrounded by so much green. 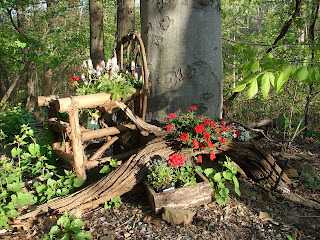 And although I only plant native plants in woods, I have an old log into which I plant bright annuals just to have a some different colors to attract my eye. I’m happy that birds like cardinals and bluebirds evolved into such bright shades. Their colors really stand out in a green forest, which is likely their point, but whatever, they are still a welcome sight. This morning Dog and I spooked a deer just a few feet from our toes (paws). We were on the lane, and the deer was only a few feet off the edge of the road, bit I still only saw a quick flash of it in the dense undergrowth. Dog and I both heard it before we caught a quick glimpse. The deer had likely bedded down for the night in that spot when we disturbed her. And because deer aren’t usually in that particular spot, I wouldn’t be surprised if she was soon to drop a fawn. Deer often do that in spots that aren’t quite in their normal hangouts. This morning the sunrise reminded me of a summer morning. Perhaps that was because the sunrise is now occurring further to the north than it did in winter; perhaps it was simply a quality of the color of the sky. In any event, the sunrise was a lovely one and prompted me to take a photo. The mid-season spring growth is now up and out. I saw the first jack-in-the pulpits this morning. All the mayapples are now in bloom. Some bird species are still missing. I usually have plenty of barn and rough-winged swallows on the slopes at Roundtop. This year I’ve found one or two barn swallows, and those not regulars. I’ve yet to see any Eastern kingbirds, who ply the grassy slopes each summer. The arrival of warblers was a non-event again this year. Warbler waves are not an every year occurrence at the cabin. The best years have come in rainier springs, when the birds roll down the mountainside like so many children at an Easter egg hunt, stopping and starting, this one, now the next one, ahead or behind as they race to find the best bugs. The spring sky was flawlessly clear during much of the warbler migration, which apparently keeps the birds at more typical migration hotspots, such as along streams, rather than on my side of the mountain. Despite my sense of this morning’s sunrise as a summery one, in other ways, it is still spring. Spring’s weather is as moody as a teenager. Temperatures are all over the place—two nights ago a frost warning, today temperatures are to be in the 80’s. The sun feels warm enough to sit out and read on most afternoons, but as soon as my spot gets shady, it feels too cool to be comfortable. But like the teenaged years, this too will pass, and the balmy days of summer will arrive soon enough. One good thing about the recent bio-blitz is that it forced me to start looking more at things in the natural world that I don't normally look at. I don't usually pay much attention to lichens and/or mosses, and I still can't identify them, but now at least I'm looking at them. In so doing, I'm finding that they are a lot more interesting than my previous inattention would indicate. Here's a tree on Roundtop with several kinds of lichens and mosses on it. I found a Web site that said Pennsylvania had just under 400 species of them. It had some photos but the photos were such close-ups that I can't really ID my lichens from them. 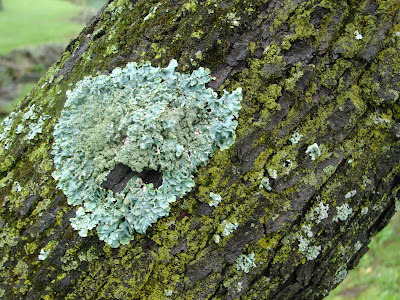 Anyway, I found the lichens on this tree particularly interesting because of the different colors and shapes. The mountain is very lush with greenery right now. An inch of rain on both Thursday and Saturday nights saw to that. Summer's canopy is so dense at the cabin that I have to walk out to the end of the driveway to see the sky. It will be that way until October or so, when the canopy starts to thin out again. It's a little tough to get used to that each year. One thing I like about winter is the view I have. I can see over to the mountain to the west and the edge of the new pond about .25 mile to the north. Now, I can see no more than 50 feet in any direction and less to the west. The forest both shelters and confines me at the same time. Last night the first truly violent thunderstorm of the season rumbled through, rattling the windows and dousing the mountain with some much needed rain. I didn't need an inch of rain to come down in 30 minutes, though, as even on a lush mountain top like Roundtop, rain coming down that fast runs off as much as it soaks in. This morning, the aftermath of the storm was fog and wet vegetation. It was too wet for Dog and me to walk in the woods, so we followed this two-track for a while instead. We followed the trail over to the new pond (which I couldn't see) and back. The extra moisture makes everything smell even more delicious to Dog than is the norm. That's a good thing, as he didn't seem to notice that the walk was shorter than our usual jaunt in the woods. The vegetation is nearly at its full expanse already. I've lost my view to the west until fall gives it back to me again. For the next 6 months or so, the expanse of my view will be limited, and I will live within the green confines of the forest, sheltered by its green embrace. After two weeks of perfectly clear and perfectly blue skies, a morning with clouds and fog feels a bit novel. The humidty of summer is starting to creep into the days, but as the temperatures are not yet above 80 degrees, the humidity isn't oppressive. My flow today is a bird foot violet. 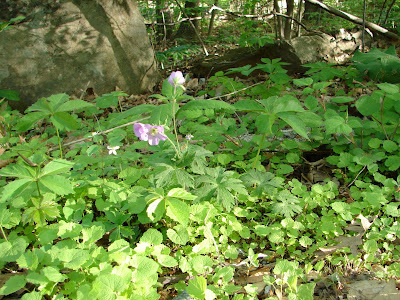 I have these and regular violets scattered throughout the front forest. This plant is just inches from the edge of my driveway. 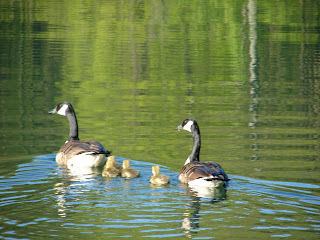 Down at the snowmaking pond, the Canada geese took their new brood of four for their first promenade yesterday morning. They are very protective parents, but the birds' curiosity got the best of them when Baby Dog started barking and whining at the fish. I should start off by mentioning that Baby Dog does not like water. She hates when even her toes get wet. The idea that she might actually get her body w et is not an idea she will entertain. Even when Dog is splashing happily in the pond, Baby Dog can not be enticed to join him. So there she was at the edge of the pond, with hungry fish gathering around the two of us. She saw the fish. She desperately wanted to do something with the fish, but she was not about to get wet to do it. So she barked at the fish, which attracted the geese enough that they floated closer and closer, wanting to find out what was going on. Baby Dog was oblivous to what eventually became 9 large birds floating just a few feet away. The fish had her attention. I kept hoping she might finally go in the pond, since she wanted those fish so badly. But it was not to be this time. Her toes remain untrammeled by water. But I still have hope. I’ve been thinking quite a lot about the little ovenbird I briefly held in my palm this past Saturday. I’m amazed how such a simple and short experience has stayed with me and has kept me thinking. Several times I’ve thought of this little bird as "my" ovenbird and have wondered which one of the several ovenbirds singing in the ("my") woods was this one. And then it occurred to me that if people don’t have similar experiences in their lives, they will have no connections to ovenbirds or a forest or the natural world as a whole. I wonder if that’s why so many people don’t seem able to relate to, say, global warming? If you’ve never stood on a glacier or noticed that the trees are now in leaf weeks before the warblers arrive or have seen that the northern species slip further north with each passing year, how can you connect to the problem in any real way? If you live in a city or only occasionally leave a town, you will only rarely, if at all, have the chance to make the connection that forces you, suddenly, to care. I’m sure everyone who already cares about the natural world has a story or an incident that changed their perception. It might be an "aha!" moment. It might have been a long, steady process of one little thing after another. But there’s something, and you know your life would be poorer if it had never happened. Somewhere along the line, you made the connection and were transformed by it. Suddenly, something had a hold on you and changed you. I’m afraid that for many people, that incident or that process never happens and their perception of the world lacks those pieces. And in the future, as more and more people live their lives in cities or within the confines of suburbia, how many fewer people will have the opportunity to experience that connection? And more importantly, what can those of us who cherish the natural world around us do to help ensure that connection is somehow made and nurtured? Senegalese conservationist Baba Dioum says it best. "For in the end, we will conserve only what we love. We will love only what we understand. We will understand only what we are taught." There are many different kinds of teachers and teachings. On Saturday, an ovenbird was my teacher and has staked his claim on me. It may be "my" ovenbird, but it has now claimed me, and I am also "his." Since I don’t live in the alps, I don’t see a true alpenglow in the mornings. I do live in the Appalachians, however, so I’m calling this view Appalachianglow, created by this morning's rising sun highlighting the top of the mountain to my west. Here at the cabin, spring has pretty much reached its peak. The eastern-pewees have arrived, and they are usually the last of the summer residents to set up shop. Surprising to me this year, the pewees arrived before I saw the first Baltimore oriole. Usually it’s the other way around, sometimes by as much as 7-10 days. The dawn chorus is now in full voice. In other news, the first of baby killdeer are out, and these tiny miniatures of the adult birds are already past the bumblebee size. The local blue jays have discovered the cat food dish and have taken to eating cat food. I can’t believe it’s good for them, but they seem to love it. Over the weekend I held an ovenbird in my hands for a few minutes. I was awakened Saturday morning by a "thud" against the window. I went outside and found the bird, stunned, underneath the window. I picked it up and held it in my palm. After a few minutes it seemed as though it would recover, but I was getting cold as I was standing outside in my pajamas and flip-flops. I put the bird in a flower pot and covered it with a washcloth, while I went inside to put something more on. When I came out, the bird had already gone. I sometimes have trouble with birds hitting my windows, especially in the early morning and sunset hours. I keep the curtains drawn and have a hawk decal, but these don’t seem to solve the problem during those murkier hours of the day. Every few years one of the birds doesn’t make it, though most need only a few minutes rest before they are flying again. I used to bring the birds into the house to recover, placing them into a basket with a towel over top of it, but after having a junco loose in the house, flying towards the windows with frenzied cats in pursuit, I stopped attempting that. I am ever amazed at how such tiny birds, like the ovenbird, can make the long and arduous trip north from the tropics, and how their song can fill the woods with sound. I heard several singing this morning and hoped one of them was "my" bird. Sunday was a day so beautiful it almost hurt to look at it. The humidity was low, the temperature was in the ‘60’s, the sky was blue from horizon to horizon. 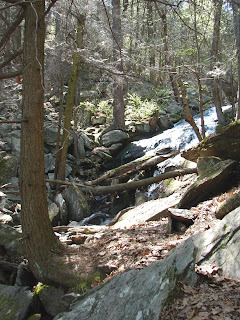 So a friend and I went hiking at Tumbling Run in Michaux State Forest, several miles south of Fuller Lake. It was her first time there. It was my uppity-teenth, but the first time back in too long. Tumbling Run Trail isn’t marked with a trail sign by the side of the road. It’s just a small, unmarked pull-off that only holds a few cars. You have to know where it is in order to find it. I can never find the right pull-off on my first try, and Sunday was no exception to this rule. The best way to tell you to get there from the northern end of Rt. 233 is to drive south until you see a small white sign on the right that tells you you’ve just entered Adams County. When you see the sign you’ve gone about 10 yards too far and will have to stop and back up. I should have known we wouldn’t have the trail to ourselves on a day this beautiful. When we finally reached the right wide spot in the road, 5-6 cars were already there. But we were undaunted and headed downhill towards Mountain Creek. Years ago a lovely stone bridge marked the path across the creek. No longer. Now you have to cross on hiker-built rickety logs. I use hiking poles to help me balance. 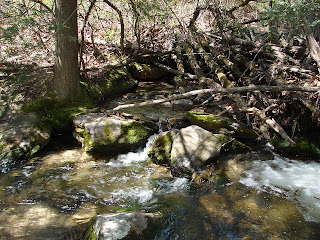 The creek isn’t very deep, and the rickety logs aren’t very high over the creek. Likely the worst that will happe n if you fall in is a wet foot, but that isn’t much fun on a hike. 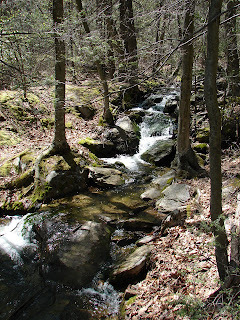 Once across this creek, we head upstream along a path that runs perpendicular to the creek we just crossed, where yet another stream empties into the larger Mountain Creek. The best way is to simply keep the creek on your left as you head uphill (and on your right on the return trip). Multiple paths abound, starting and stopping without much warning, as hikers look for the easier path through the rocks and hemlocks. The path that looks easiest today will be different tomorrow as water levels or fallen trees change. I heard an olive-sided flycatcher call "Quick, three beers!" in the lower section, where the stream was still small. Further up, a large frog jumped just ahead of my tread. One family we passed reported seeing a "lizard" but I have no idea what that was. The hike to the waterfall is only about 1.5 miles up but it requires constant clambering over and around rocks and trees, so it’s a good workout. It is possible to make a 7 mile loop by going above the falls and hooking up with the Appalachian Trail and then a blue-blazed trail, but this section along the stream is the prettiest, and somehow the loop always seems a bit anticlimactic to me. 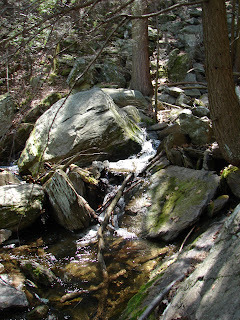 The hike is lovely in any season, though because it is steep, it is quite slippery when wet. On a dry day like Sunday, it is suitable for older children and dogs. We saw a youngster of 8-9 making the trek, with the assistance of parents. We also saw many dogs, including, improbably, an enthusiastic Pekingese who was doing remarkably well on the boulders. Our hike culminated at the waterfall where we rested and enjoyed the view. The rocks above us are called Lewis the Robber rocks after an outlaw who, legend has it, hid out here after robbing a payroll wagon sometime in the early days of the Civil War. Naturally, the legend also reports that the money was never found. Whatever the truth (or lack thereof) around this legend, the fact is that it’s plausible someone might have hidden out in this area. It’s fairly remote (and would have been more so back then), difficult and slow to traverse, and someone up near the falls would have a good view of someone moving down below. Whatever, it makes a good story. After we’d enjoyed the view for a while, we headed back down. It’s always amazing to me that the path that looks easiest on the way up is usually not the path that looks easiest on the way down. We made good time on the way down, despite the rocks, though we had no need or desire to hurry. It was that kind of day. The weather this week has been spectacular--sunny and clear with temperatures floating a few degrees higher or lower each day. It’s the kind of weather that gives spring its Disney-esque reputation for chirping birds, baby animals and flowering plants. Each day I have more new wildflowers to look at. I can’t keep up with them all. 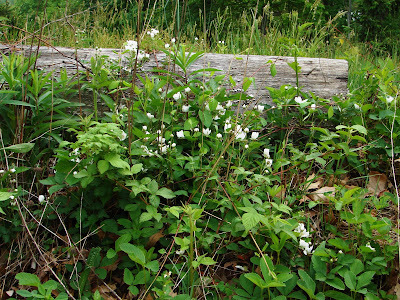 Today’s photo is one of wild violets at the edge of the cabin. 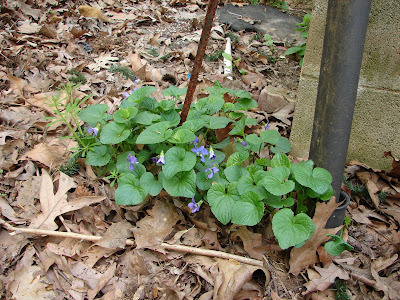 I don’t need to plant anything there when I know the violets will return each spring to brighten the spot. Early this morning Dog and I heard the fox barking again. This time the fox was further down the mountain instead of right next to the cabin. The yapping went on for some minutes, an eerie and haunting sound in the moments before sunrise. It is not quite on a par with the haunting sound of a loon or even a wood thrush, but it is close. I’m so lucky not to have a yard. Instead of spending my weekends or evenings mowing, I can wander around the cabin, camera in hand, looking for new arrivals or listening for the sound of a barking fox. Of all the reasons why I most like not to have a yard, my favorite is simply that I don’t have to spend my time dealing with it. I have the time to pay attention to other things instead. Isn’t this a lovely bloom? The flower is about 1.5 inches across, and as you can see, it has no leaves. It’s just this gaudy bloom bursting onto the forest floor. I don’t really know what it is, though I have a theory, perhaps a half-baked theory. The flower is right next to many, many mayapples. And to me, the bloom looks like a mayapple bloom. So here are the odd parts. 1) Mayflowers bloom underneath a wide canopy of the mayapple leaves. The stalk rises, the plant splits into one or more stems, at the end of each is a large green leaf that serves to create an umbrella-like shade. The blooms appear where the plant splits into the several leaves or about halfway between the ground and the leaf. The blooms are shaded by the leaves, and you really have to crawl under the plant to see the blooms. 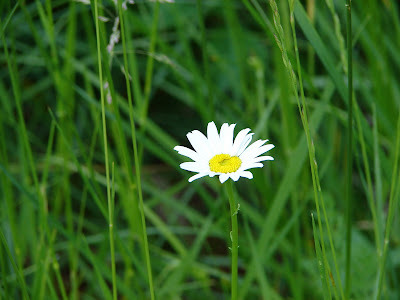 Now above (or even below) this flower, you can see there are no leaves of any kind. 2) Mayflower leaves are up and covering the woods, but not a single one of them is blooming yet. The flowers are all still in bud. Still, somehow, I suspect this is a mayapple bloom. 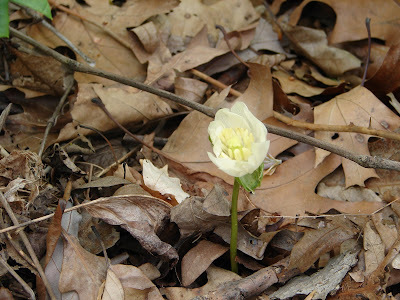 The early bloom might be explained by the fact that this little bloom is getting full sun, and the regular mayapples are mostly shaded by their plant’s large leaves. I sure can’t explain the no leaves part, though. 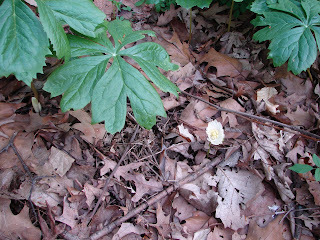 The second photo shows how this little plant is positioned among several of the other, still nonblooming mayapple plants. If anyone has a dissenting or better idea as to what this bloom is, I’d love to hear it. Last night a thunderstorm rolled north past Roundtop. It was eventually close enough that I heard a few claps of distant thunder, but my first inkling a storm was near were flashes of lightning that momentarily brightened the darkened woods. Around here we still call this "heat lightning," though pretty much everyone now knows the lightning isn’t caused by heat. It’s just a term we still use because there isn’t another term to fill the gap. Probably years ago people did think flashes of lightning from a distant storm that never got closer were caused by heat. But just because we now know better doesn’t mean the term has disappeared. "I saw heat lightning last night" someone will say, and heads at the diner will nod knowingly and a conversation will start. So what else should we call it? Can you imagine someone saying, "I saw distant lightning from a thunderstorm last night?" and have that be a conversation starter? It doesn’t h ave the same ring to it, does it? So the term persists, despite its inaccuracy. So, I had heat lightning last night when I took Baby Dog for the last walk of the day. I have found that heat lightning is most noticeable in a cloudy sky, likely because the flashes of light bounce off the clouds and are then seen over a greater distance than would be the case in a clear sky. I expected Baby Dog to notice the event, but she didn’t, nor did she bark when the storm eventually got close enough so that thunder rumbled through the woods. Perhaps she is finally growing up. My first photo today is a view readers to this blog will have seen before. 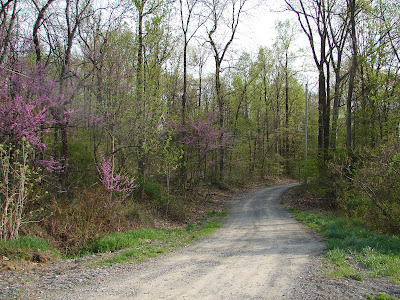 It's the bottom of my driveway and looking up towards the cabin. Spring is blossoming out so quickly that in only a few days the view already looks a lot more lush than it did just a few days ago. 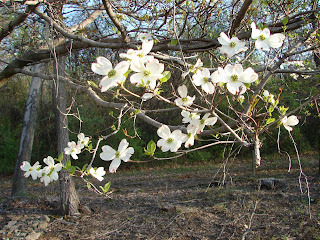 The second photo is of a blooming dogwood tree. There's no denying that spring is a beautiful time of year. It's not every day that I see a new bird at the cabin. I've lived here 17 years now and have 130 species on my cabin list. I am happy to report that this morning (in poor light) I found a new bird on one of the snowmaking ponds--an American coot. 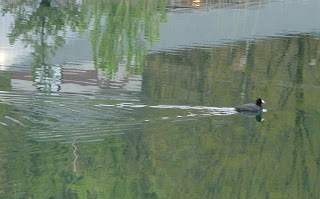 The resdient Canada geese are not pleased, nor are the mallard pair that frequent the pond. But for now the bird is here, snaking between the cat-o-nine tails at the far end of the pond. This morning a rainbow appeared before the rain, before the sun poked above the eastern horizon. It was the earliest in the day I've even seen a rainbow. I was walking Dog, and we had just reached the far end of our morning walk. I turned around to head back to the cabin and there it was, just waiting for me to turn around and see its early morning glory. The 'bow was almost directly overhead, highlighted in the cloudy sky. As it was still early and only just at sunrise, the camera was not with me, so this rainbow will remain only as a picture in my mind. Dog, I must say, was unimpressed, but it took my breath away. Around the cabin spring continues in a headlong rush. More plants pop up each day. The leaves are visibly further along from morning to night. My view to the west is fast disappearing, and soon I will be living within the green box of the dense summer forest again.